If you are a recent college graduate, there are certain skills and qualities employers are looking for that will improve your chances of getting a new job. Find out which are most important in the following post. 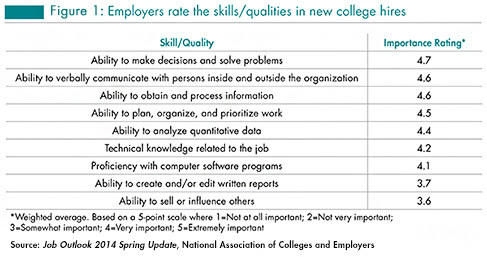 When it comes to a job seeker’s skills and qualities, employers recruiting from the college Class of 2014 are looking for candidates who are decisive, can solve problems, are good communicators, and are analytical, according to results of a new survey by the National Association of Colleges and Employers (NACE). “Employers want to see in candidates the skills that are necessary to excel in the workplace and help the organization,” says Marilyn Mackes, NACE’s executive director. Employers responding to the association’s Job Outlook 2014 Spring Update survey rated “ability to make decisions and solve problems,” “ability to verbally communicate with persons inside and outside the organization,” and “ability to obtain and process information” as the most important candidate skills/qualities.